My niece is currently serving time in prison. She made some unwise choices during her life and is paying for them now. One day when she was in her early 20's, she was babysitting with a friend's four-year-old boy who was playing with her own son of the same age. She went about her business--which may have included drug use--as the boys played outside by themselves. When she couldn't find them later, the neighbors were called into action. The boys were finally found in an abandoned refrigerator that belonged to the next door neighbor. They had suffocated. My niece, rather than allowing herself to feel all the resulting emotions of this tragedy, turned to drugs to dull the pain. A downward spiral began that included an addiction to drugs and alcohol, abusive relationships, and prostitution. Eventually she had another child--a son, and that child was removed from her care as she went off to serve time for violating a probation she got for making and selling methamphetamines. She will be starting over after serving her year in prison. Will she make it? I don't know. Before she was arrested the last time she had gone back to school and was studying to become a drug counselor. She had become active in a church and had formed a healthy relationship with a man who loved her dearly. She made the mistake of driving after a few drinks and was arrested. Life is about learning lessons as I wrote in my last blog. Each action we take has a consequence. It may be a positive and happy one or it may be painful. Some of us learn the hard way. I have on many occasions. I am choosing to see the good in my niece and to pray for her strength in making the right choices in the future. If you have some choices to make in your life, I pray that you, too, are divinely guided in making those choices. Life is about learning lessons and Earth is our classroom. Many teachers come into our lives over a lifetime--some are welcomed by us and others are not. But they all have lessons for us to learn. Do you have someone in your life today that pushes your buttons? Maybe it's your boss, a co-worker, or perhaps it's someone in your family. Maybe it's even one of your children! If we are conscious of the fact that our most challenging relationships have the most to teach us, we can approach them in a different way. When someone comes into our life that says or does something that immediately upset us, the first thing we should do is to consider why we are upset. Many times we have a reaction to someone because they have a characteristic that we also have within us, but have not accepted or embraced. The person becomes a mirror to help us see this aspect of ourselves. Sometimes this realization can be enough to change the relationship with the other person. Other times healing may take longer. In this moment, think of the person that most often gets you upset, angry, or frustrated. What is it about this person that upsets you most? Consider, honestly, if you have that same characteristic too. Now you can decide: Can I accept this part of myself and realize that I have the ability to decide if I will invite it to express through me in the future? Once you are aware of an aspect within yourself, you can choose. But remember that we all have aspects within ourselves that we may not like to see--pettiness, jealousy, unforgiveness. Make friends with your aspects and embrace them as part of your human experience, but let them know that you will be utilizing their services less in the coming days. On this, the day after Thanksgiving, why not give thanks for all your teachers. Happy Thanksgiving! When you think of Thanksgiving, what do you think about? Is it the days off that you have (yay!) from work or school? The turkey and pumpkin pie that you're about to devour? As a child, I loved Thanksgiving because all of our family got together at my grandmother's house. My cousins and I would run around the big house and slide in our stocking feet on the freshly waxed wood floors. We'd sneak pieces of turkey off the platter before it was served and drag games out of Granny's toy closet to play. It would be a noisy day, filled with talk and laughter, pans banging in the kitchen, and aromas that made my mouth water. Plates would be filled, grace would be said and then the forks would fly. I loved holidays at Granny's house and the hugs that I got from my grandparents, aunts and uncles. It was as comfortable as a warm quilt and as I write this now I remember it vividly. Today, my husband and I will have a quiet Thanksgiving dinner together. We live thousands of miles from any family. We're grateful to have each other and our little parrot, Joey. But we do miss our families at this time of year. We don't always appreciate things in the moment. Sometimes it takes the passage of time to make us see how wonderful and precious our experiences are. Today, wherever you are, think about the memories that you are creating. And give thanks. I consider myself to be a Christian, however, I am a progressive Christian and not a conservative. Over the years that George W. Bush has been in office, I have found myself angry at times at the way many of the Republicans and the conservative Christians have tried to force their religious beliefs on the whole country. The conservative Christians have used their literalistic interpretation of the Bible to try to push their agendas against abortion, embryonic stem cell research and gay marriage. They have argued for prayer in public schools and the inclusion of intelligent design into curriculum. My home state of Kansas has been an embarrassing battleground for this war to teach intelligent design in science classes, where (in my opinion) it does not belong. Our forefathers clearly intended this to be a country where there was a separation of church and state. They knew that if this divide was breached, that there would be problems. The conservative Christians would have the children in our schools praying to Jesus, when there might be Jewish, Budhist, or Muslim children in the classroom. To force them to pray Christian prayers is not only unconstitutional, it is religious abuse. We, as citizens of this country, have a right to our own personal religous beliefs. We have a right to believe in a god--or gods, or to be an atheist. To force anyone, children or adults, to practice a religion is against the very beliefs this country was founded upon. As we all know, but may have forgotten with everything else going on in the world...there was a devastating earthquake in Pakistan and Kashmir. Over 3.8 million people in that part of the world are now homeless and it is getting colder every day. Tens of thousands of people could die of exposure. Richard Berger, a concerned soul and resident of Seattle, felt frustrated by the lack of response from the world to the dire circumstances. He decided to do something. He investigated an emergency survival blanket, called "Heatsheets" that reflects up to 90% of body heat to help keep people warm. The blankets are large enough for two adults. Richard worked out a deal with the manufacturer, Adventure Medical Kits, and they were willing to provide their blankets at cost ($1 per blanket). Richard then contacted Mercy Corps, one of the largest disaster relief agencies now helping in Pakistan, and they agreed to help get the blankets up into the Himalayas by donkeys where the trucks cannot go to help those people who face the coldest temperatures. Richard says that it is important to put CR96 on your check so that Mercy Corps will know that your check goes to the blanket donation fund. Remember, every dollar buys one blanket, so give what you can and know that for each one you buy, you are saving at least two lives. Have you noticed that our planet is going through changes? Many people, especially the Native Americans and indigenous people around the world have noticed and been preparing themselves for this change for quite some time. We have now been informed that what was pooh-poohed as a nonsensical theory, is now true. Our planet is heating up--global warming is something that we all need to be aware of. If you research (not watch tv) you'll find out other things; the birds are no longer migrating to the places they once did; indigenous people are no longer choosing to have children; salmon are not spawning. There are many stronger and more frequent earthquakes, tornados and hurricanes than ever before. What do we, as individuals do at this time of environmental change? We pray and we change our consciousness. Praying changes consciousness. We hold the "high watch" meaning we behold the love, peace, and serenity of our surroundings even when we do not see or feel it. Scientists have proven that our thoughts and the energy they produce changes everything around us. Do not fill yourself with fear. Surround yourself with a mantle of peace and act from that place within you that is calm. Lastly, take steps to preserve our planet--use less fossil fuels, recycle, don't litter--treat our earth with love and respect. When I see people toss cigarette butts out their car windows, I cringe. These people would not act so carelessly in their houses, and yet they do it to our earth home. Mother Earth has to sustain us and many generations after us and we are her caretakers. How we perceive something determines our experience. Let me explain. Suppose you get a speeding ticket driving to work one day. Do you get upset and angry at the police officer for stopping you? Do you let it ruin your day thinking about the $75 that you must fork over to pay the ticket? Suppose you were to learn that while you were stopped by the side of the road, there was a car accident up ahead where many cars were involved and people were injured or killed. Suppose you knew that had you not been stopped by the police officer, you too may have been in that accident. How would you then feel about getting the ticket? The $75 ticket would seem very inexpensive if it saved your life. Your perception would have changed, right? And because your perception changed, your experience also changed. We have the opportunity to decide how we are going to perceive everything that happens to us. We can choose to trust that something is happening for our highest good or we can feel like a victim and react in an angry way. All of us have had experiences where something good came out of an incident or situation that initially looked challenging and perhaps felt devastating. Look at the picture below. 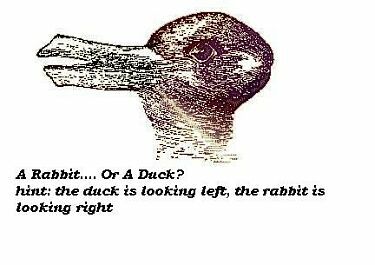 Do you see a duck or do you see a rabbit? You cannot see one while you are perceiving the other. But you can choose which one you wish to see within your mind. Shift your perception. So, right now, if something is going on in your life that you have been feeling sad, angry, or frustrated about--why not change your perception and see it as something potentially good.